Though a few well-known favourites dominate popular perceptions of the Greek archipelago – Santorini, Corfu and Mykonos spring to mind – there are thousands of islands to explore, each of them with their own style, creating a menagerie of paradisiacal destinations to choose from. 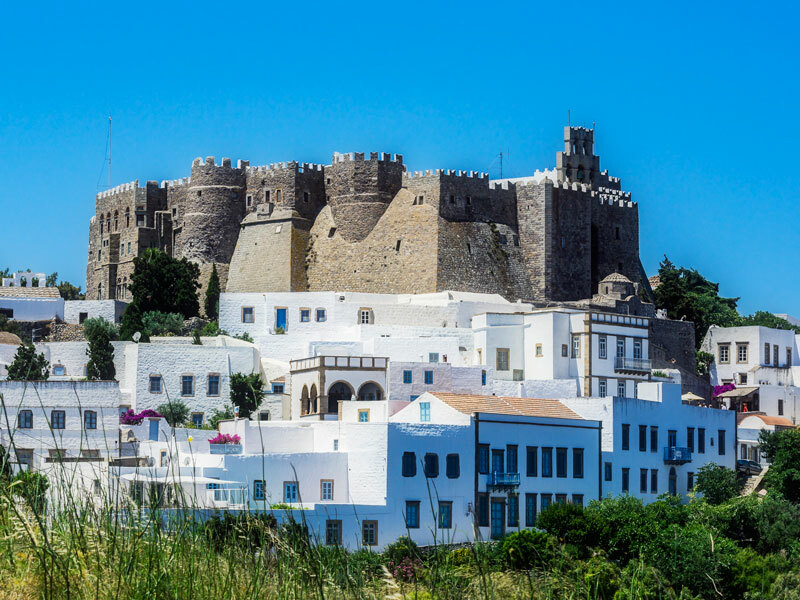 Patmos is a fine example of one of the country’s many stunning destinations. Located in the north of Greece’s Dodecanese island group, Patmos is a classic Greek isle, complete with iconic whitewashed walls and ancient castles. Of course, when visiting one of the Aegean’s beautiful islands, a trip to the beach is a must; on the south side of the island, visitors will find the sandy Petra Beach. A favourite with tourists, Petra is well served by a host of amenities and hotels. For a less crowded seaside spot, the island’s northern beaches offer explorers the chance to discover the many caves and pools that pepper the coastline. The water might be a little colder, but swimmers will soon warm up under the Mediterranean sun. Patmos is perhaps best known for its importance to the Christian faith. As home to the Holy Cave of the Apocalypse, Patmos is a site that has drawn religious pilgrims for millennia. Situated about halfway up the island’s mountain, the cave is believed to be the location in which Saint John the Theologian wrote the Book of Revelation. According to Christian tradition, it was within the Holy Cave that Saint John spoke with God, who recited to him the final book of the Bible. The book, which is a prophecy of the end of the world, has great significance to Christians, and the site is one of only two places in which Christians believe the voice of God has been heard. Today, the Holy Cave has become a place of worship, where visitors can see where Saint John’s account of the apocalypse was written, as well as the abode in which he took refuge upon his exile to Patmos in AD 95. In 1999, UNESCO declared the cave, together with the adjacent Monastery of Saint John the Theologian, a World Heritage Site. As such, visitors of every faith – or those of none – can be inspired by the serenity of the place and its historical significance. Remarkably, this small volcanic island is home to around 500 churches and monasteries, from recently uncovered hidden crypts to architectural wonders featuring impressive collections of Baroque artefacts. Easter is an especially lively time in Patmos, with celebrations and traditions that hark back centuries taking place throughout the island. As well as being home to many religious sites, Patmos has an upmarket side to it. With trendy boutique shops and sophisticated bars, not to mention an abundance of restaurants boasting fresh and healthy Greek cuisine, Patmos offers a pleasant balance between tranquillity and vibrancy. Adding to this is the fact that, while it has bars that are open until the early hours, clubs and beach parties are limited. Instead of the wild partying that some Greek islands have become known for, in Patmos you’ll find a more chic crowd. This, together with a wide range of upscale hotels and traditional lodgings, makes Patmos an ideal destination for business travellers. And, being a Greek island, there are of course numerous excellent beaches and phenomenal views to enjoy. It may be one of many, but the island of Patmos is certainly one of a kind.